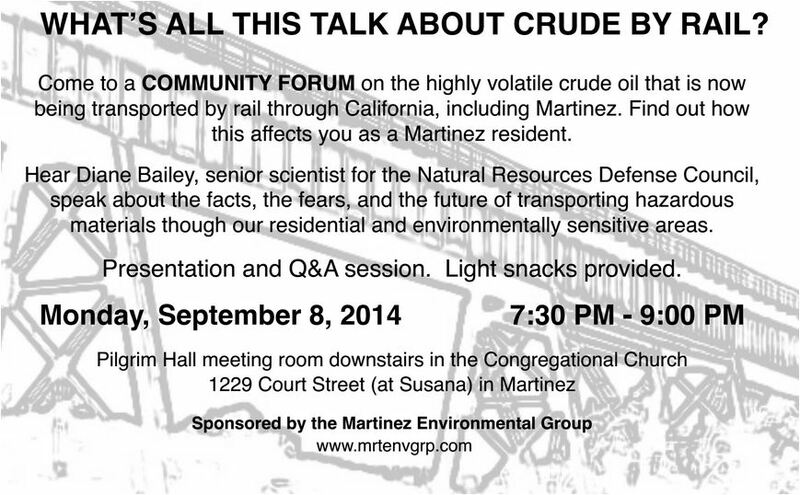 Learn more about Valero’s crude by rail project and how it might affect Benicia residents at a Community Informational Forum on Sunday, January 18, 2015, from 1:00 to 4:00 pm at the Benicia Public Library, 150 East L Street, Doña Benicia Room. The Forum is sponsored by Benicians for a Safe and Healthy Community (BSHC), a grassroots organization advocating responsible environmental action and currently working to STOP crude by rail in Benicia. Diane Bailey, Senior Scientist in the Health and Environment Program for the Natural Resources Defense Council. Members of BSHC will also provide an update on our work. Marilyn Bardet will discuss the history and status of the project’s Draft Environmental Impact Report (DEIR). Andrés Soto will discuss the local, regional and cumulative impacts of transporting crude oil by rail. There will be plenty of time for questions, discussion and brainstorming. For more information about the Community Forum or BSHC, please call (707) 742-3597, or email info@SafeBenicia. For more information about Valero Crude by Rail check out SafeBenicia.org. Of course, you can find lots of info here on BeniciaIndependent.org.